In poetry and other forms of writing, symbolism is often used to convey a specific meaning to the audience. Writers often employ this literary device as a means of artistic expression. Why say, "I'm lonely," when you can paint a picture of a lone moon "wandering companionless" through the night sky? How beautiful is that? In each of the examples below, notice that each symbol aligns with the overall tone and theme of the poem. That is, if it's a tough subject, the words will take on a negative or morose tone, while the symbols evoke images of cold or dark objects. These indicators will also align with the theme, or overall message, of the poem. In Wordsworth's poem, we see sparks of hope. 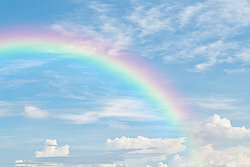 When he sees a rainbow in the sky, it's not merely a beautiful sight to behold. It also symbolizes his childish wonder. Wordsworth maintains a large part of his childish wonder by remaining in awe in the beauty of nature (and encourages his audience to do the same). In this poem by Percy Bysshe Shelley, the moon symbolizes loneliness and unrequited love. In fact, Shelley describes it as "wandering companionless." How sad. Notice the tone of some of the other words below like "weariness" and "joyless." They align well with the symbolism invoked by a lonely moon. In Alfred Edward Housman's famous poem, the ferry is a symbolism for death. Notice the narrator is alone on a nighted ferry; it aligns rather well with thoughts of death and dying. The final two words also align with the theme, indicating the narrator won't be found when the ship docks in the wharf. In a deeper sense, this is also a nod to Greek mythology. You had to pay a coin (this is why Ancient Greeks put coins on the eyes of the deceased) to Charon the ferryman to take you across the river Styx to Hades. Charon's job was to carry the souls of the newly deceased to the land of the dead. The Archpoet uses a withered leaf in this poem to symbolize aging. We're reminded of our elemental nature and the fact that, in the end, our bodies break down to a point where we're no stronger than a withered leaf. Symbols for hope and happiness are usually easy to pick up. We enjoyed visions of rainbows in Wordsworth's poem. Now, Emily Dickinson will use light in a similar fashion. This, too, is a viable symbol for the representation of happiness and hope. In this poem, Robert Frost is discussing Christianity. The house of make-believe is a symbol for the religion. It's a rather harsh symbol, too, when you consider he's comparing believers to children in a house of make-believe. A few lines later, the narrator tells us he stole the goblet from the children's house. This is a symbol for his rejection of faith, which is rather apparent by his scorching comparisons to a house of make-believe. To no surprise, we come upon another poem that links nature and humanity. Here, Romantic era poet William Blake uses sunflowers to represent people. We, as people, sometimes grow weary as life carries on. Blake also uses the sun to symbolize life. Weary sunflowers count the steps to the sun. Or, weary people march their way to the end of their lives. Fortunately, not all of Blake's poems were bleak. It just so happens that two of his finest examples of symbolism come from rather dreary pieces. In "London," Blake offers a morose glimpse into London life during his time. He conveys his message, without directly pointing any fingers. Below, we'll see him use "chimney sweepers" to refer to child labor, "palace walls" to refer to the monarchy and "chart'd" streets and rivers" to refer to the power of chartered banks and investment firms over the common people. Symbolism can be as sinuous as you please. That is, it can take readers through sharp curves and unexpected turns. But, beyond the excitement of it all, symbolism is a powerful support system to the theme of any given work. If the theme of the poem is the treachery inflicted upon the impoverished Londoners, then it makes sense to evoke images of dirty chimney sweeps and hapless cries. To continue your study into this evocative literary device, enjoy Examples of Symbolism. "Examples of Symbolism in Poetry." YourDictionary, n.d. Web. 23 April 2019. <https://examples.yourdictionary.com/examples-of-symbolism-in-poetry.html>. In poetry and other forms of writing, symbolism is often used to convey a specific meaning to the audience. Writers often employ this literary device as a means of artistic expression. Why say, “I’m lonely,” when you can paint a picture of a lone moon “wandering companionless” through the night sky? How beautiful is that?In each of the examples below, notice that each symbol aligns with the overall tone and theme of the poem. That is, if it’s a tough subject, the words will take on a negative or morose tone, while the symbols evoke images of cold or dark objects. These indicators will also align with the theme, or overall message, of the poem.